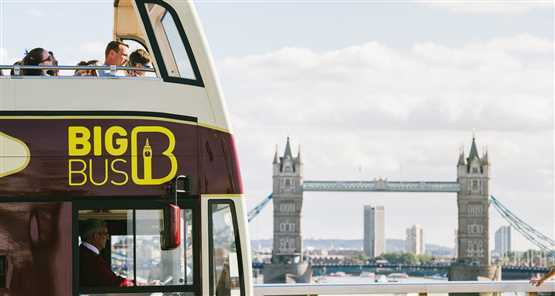 This incredible package deal is just the ticket to show London at its very best; from the amazing panoramas available by purchasing London Eye tickets to the complete sightseeing experience atop one of the city’s famous double-decker buses – The Big Bus Tour. With three separate routes to ride covering all of London's most impressive attractions, including venues such as St Paul's Cathedral and the Houses of Parliament, you'll have the entire city at your disposal. Hop on/hop off as many times as you like while you explore the streets of London aided by insightful on-board commentary. We also include a free River Thames cruise with your Big Bus Tour ticket, allowing you to see the capital from the water, land and air! The London Eye towers 440 feet above central London with remarkable views stretching for over 40 miles in every direction. Step into a state of the art capsule containing exclusive content on many of London's most iconic landmarks which you can control at the touch of button. You will also have access to the 4D experience, filmed in stunning 3D with added special effects, including time lapse technology as well as wind, bubbles and mist generators which help tell the heart-warming story of a father and daughter's adventure though the city. Timings are subject to change. Please check on your arrival. River cruises, operated by City Cruises, are included in all tickets with Classic Tickets offering a one-way cruise between Westminster Pier and the Tower of London (in either direction). River cruises depart approx. every 20 minutes in summertime and every 30-40 minutes in winter. The voucher for your River Cruise can be collected at any of the manned bus stops. The tour is guided in English and departs at 10.30am every day from Trafalgar Square (Stop #15 – red and blue routes) and will last approximately 1.5 hours. By Tube: Waterloo is the closest tube station to the London Eye. Waterloo is about five minutes walking distance. Exit the station following signs for the South Bank. Embankment and Charing Cross stations are close together on the north side of the River Thames. Both tube stations are a ten-fifteen minute walk to reach the London Eye. From the station, cross over Hungerford Bridge. By Train: The closest rail stations to the London Eye are Waterloo and Charing Cross. Waterloo is the closest rail station to the London Eye. Waterloo is about five minutes walking distance; take exit six for the South Bank and follow the signs. Charing Cross is about a fifteen minute walk to the London Eye. Cross over Hungerford Bridge. Great day out, got to see everything we wanted. Peter the guide on the bus was full of useful information and had us all interested including our kids. Well done! Really easy to find and use with friendly staff. A great experience. We all had a lovely time in London on Sunday apart from the rain. The trip we booked was Big bus tours & The London Eye. This was a lot cheaper booking through discount London than direct. The service on the bus & the London eye was very good. I highly recommend the bus tour it’s a very easy way to travel round London especially the hop on & off service. Never had to wait long for a bus. What a fab whirl wind day out we all had. The three kids were amazed, saw sights on the bus that wouldn't be possible, walking. London eye was my fourth time but kids first they couldn't believe the experience. Recommended without a doubt. See London from another perspective as you journey along the River Thames. Imagine the sights, sounds and smells which greeted merchants arriving into London in ancient times and the thousands of vessels carrying goods to and from the capital. Take in all of the famous riverside landmarks and watch Tower Bridge come into view; the most majestic of London’s bridges. Enjoy recorded commentary picking out the best of the sites to see. Walk in the footsteps of the British Royal Family and the politicians of today and yesteryear as you journey past many of London’s most exciting royal and political addresses. Wind from Trafalgar Square amongst the smart addresses of Carlton Gardens before arriving at the majesty of the Mall and St James’ Park, ending under the archway of Horse Guard’s Parade to Whitehall. Imagine the crowds lining the streets for Royal Weddings and the political intrigue hidden from view on Whitehall; your guide will give you a fascinating glimpse into both the history and modern day of British royalty and politics. Had a brilliant day out in London. Easily exchanged tickets outside Baker Street tube station. All the big bus staff were very friendly and helpful. London Eye was amazing well worth the wait. Thanks Discount London would definitely recommend and use again! Big Steve is the guide to get on the Red Route. He is most informative, helpful, full of entertaining stories, and best of all - he’s really funny. We did the bus and eye package so the twins could see lots of London. I've seen things I've never seen before. It was a fab thing to do. The river cruise was very comical and very enjoyable. Although the London marathon caused trouble, we got a second day for free. thank you. We had a fantastic time down in London thanks to the extremely easy to use and very well signposted routes for the big bus tour bus. As for the London Eye, the queues to get on look massive but it moves VERY quickly and definitely worth the wait. Would highly recommend it.